Regular exercise is important to help keep your dog's heart, lungs, joints, and muscles healthy. It also helps their minds stay healthy and happy and can alleviate behavioral problems. Exercising doesn't mean you have to go running with your dog every day; there are many fun ways to get exercise while enjoying quality bonding time with your dog. - Walk, run, or hike with your dog: mix it up once in a while and try a different route or a new area, or invite a friend and her dog to come with you. - Go to the dog park! Provided your dog is healthy, well- socialized, and has reliable recall, a dog park is a great place to let him play with other dogs. - Enjoy a good round of "fetch". Many dogs like to retrieve objects and it's great exercise! Get your dog a lightweight, soft object for him to fetch -- they are safest in that they will minimize and hopefully prevent damage to your dog's mouth and teeth. Jumping can cause soft tissue injuries, so keep your tosses low to the ground. - Play games! 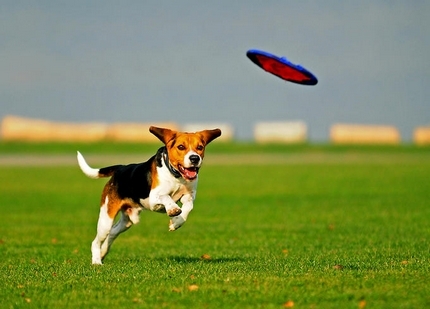 Games can give your dog the opportunity to exercise his brain as well as his body. For example, you can play "hide and seek" with your dog. While inside the house or in a safely fenced area, ask your dog to "sit and stay", then go hide. When you're ready call him to come and find you. You can also play this game using one of your dog's favourite toys or a treat. - How about a day at the lake? Many dogs enjoy swimming or splashing about in the water (not all dogs are natural swimmers so don't force your dog to go in if he's scared). You could join your dog and have fun together! Some beaches are designated as "dog beaches" so it's like a dog park and a swimming hole all-in-one. - Ski with your dog! Skijoring is basically cross- country skiing with your dog. The dog is harnessed to the skiier and helps to pull them along. There are courses you can take to introduce you to skijoring and to show you how to safely enjoy the sport. Most instructors say that dogs should be at least 15 kg to skijor. - Dog sports such as agility or flyball, which are immensely popular. They provide a way for dogs to expend energy while also forming a closer bond with their people, since the two of you work together. - Start slowly, especially if your dog isn't accustomed to exercise. - Take into consideration your dog's physical abilities and preferences. Senior dogs or dogs with health issues may not be capable of lots of strenous exercise. 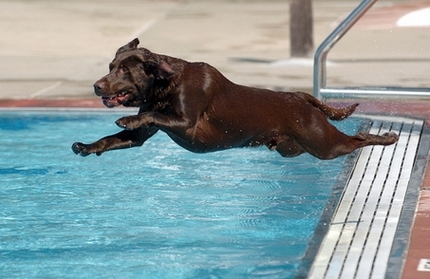 And some dogs simply don't enjoy water. Keep it fun and your dog will look forward to his next outing. - Watch out for other recreational users. Try to stay off trails meant for snowmobiling, ATVing, or other sports where there is a risk of a serious collision between your dog and another person or vehicle. - Don't exercise your dog in weather conditions that are too hot or too cold. Dogs with pushed-in faces, such as Pekingese or Pugs, are especially susceptible to heat stroke and humidity. In cold temperatures you may need to provide your dog with boots and as weater to keep him warm. Dogs get cold too -- even with fur coats! - Try to maintain a regular exercise routine. Dogs that are mostly sedentary during the week, then let out for a wild run on the weekend, for instance, are more prone to injury because their bodies are unaccustomed to the exercise. - Always have plenty of fresh water on hand to keep your dog hydrated.